As one of the seminal beat-’em-ups ever made, Final Fight has been ported several times to a multitude of formats. While no version is truly arcade-perfect, a few have come darn close, especially the rock-solid GBA cart. Long before emulation and über powerful portables, there was only the underpowered consoles to turn to for your arcade fix. On the one hand, you had the SNES, fresh from the factory and ready to challenge the Genesis for control of the 16-bit market. With its built-in scaling and rotation, immense color palate (32,000+), as well as an incredible sound chip, it looked like the Genesis would soon be made obsolete. The problem was, many initial SNES titles suffered from massive slowdown and flicker. Granted, as time went on and developers learned the ins and outs of the machine, many of the early hurdles were overcome. Still, it was a blemish on the SNES’s launch that allowed the Genesis to maintain its early lead until a certain blue hedgehog came on the scene. On the other hand, we have Sega’s much-maligned add-on, the Sega CD. It remedied the Genesis’s lack of hardware rotation and scaling, and it was supposed to take Sega gaming to the “next level.” Unfortunately, it too had a shaky start, as it was plagued with games that were merely the cartridge versions with a CD soundtrack. Moreover, the insane emphasis by Sega on full-motion video games put the Sega CD at a disadvantage that it never overcame. So, both consoles had their ups and downs and were theoretically more than capable of providing a perfect port of Final Fight. Sega-16 put both versions through their paces and while neither is an exact copy of the arcade classic, they both come close. What’s really interesting is that both are more alike than you’d initially think, given the huge difference in power between the two systems. Presentation: Anyone who’s ever played the SNES version of Final Fight knows what they’re in for: a no-frills pick-up-and-play version that almost chugs to a standstill. No extra modes (there isn’t even an option menu! ), missing several key elements of the coin-op, and seemingly too much for the hardware to handle, it left fans heartbroken at just how much was missing. You’d notice that while the visuals were spot-on, there was really nothing else that jumped out at you, save for the massive amounts of slowdown and flicker. At times, it got so bad that entire sprites disappeared in broad strokes across the screen. At the heart of this was the SNES’s painfully slow CPU (it had a maximum clock speed of 3.58 Mhz, even slower than the original Game Boy’s! ), which made clean programming a big problem during the system’s early days. Perhaps the biggest travesty was the omission of one of Final Fight‘s main characters. Guy was conspicuously absent, leaving only Cody and Haggar to save poor Jessica. 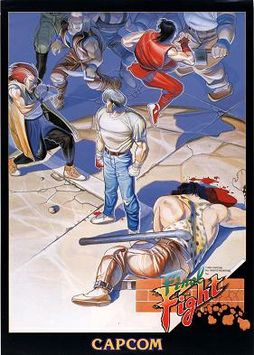 Capcom attempted to remedy this glaring problem by making another version of the game called Final Fight Guy, which appeared in Japan in 1992. It took another two years to cross the Pacific, and then it only did so as a rental-only release. In their brilliance, Capcom traded Guy for Cody, which still left players with only two playable characters. When Sega reprogrammed the game for the Sega CD in 1993, they took advantage of the large storage capacity the new medium offered. Final Fight CD had all three heroes from the arcade, and it added some new bonuses. In addition to an option menu which featured three levels of difficulty and a bonus life setting, this version also boasted a great time attack mode. It had a new stage and offered a welcome change of pace from the regular game. Perhaps the most notable changes made were the inclusion of extended animated opening and ending sequences, complete with voice acting. Together with the awesome redbook soundtrack, it was a great piece to show friends who doubted the Sega CD’s capabilities. Both versions were heavily edited for their domestic releases, but the Sega CD got off easier than its cartridge sibling. Poison and Roxy were left in the game and only had their clothes slightly modified to conceal previously exposed bosom and thighs. Both were replaced entirely on the SNES. Other small cosmetic changes were made, like the elimination of a tied-up Jessica in the opening sequence, and some name changes (Damnd was changed to “Thrasher,” and Sodom became “Katana”). Graphics: Here’s where both versions fought practically to a stalemate. Though the Sega CD port had better detail, its colors appeared very washed out compared to the arcade and SNES games. Surprisingly, it was one of the more colorful Genesis releases of the time; it simply could not compete with the 32k+ color palate of Nintendo’s console. Even so, it was quite capable of besting its opponent in overall detail, as notable in the shots below. The backgrounds on CD were more vivid and drawn, where they were sometimes completely gone in the cart. While sprites remained about the same size for both, the camera did seem more drawn in on the SNES. Given that neither rendition had a distinct advantage over the other, and considering that each appeared superior in one aspect but faltering in another, this part of our contest appears to be a draw. Sound/Music: Yes, Sega’s reprogrammed arranges soundtrack was excellent, that much was obvious. What was truly surprising was just how substandard the pieces were on the SNES. I know that truly memorable scores were possible on the console (Actraiser, anyone? ), but I’m not sure what happened here. Songs sounded tinny and as though they were missing instruments. Perhaps I’m spoiled by the wonderful CD tunes, but the SNES’s soundtrack is most definitely lacking. I know, it almost makes no sense to make a comparison, as the Sega CD’s redbook audio trumped anything even the SNES’s great Sony sound chip could muster, but the music isn’t the only thing we need to look at here. The audio is also a problem for the SNES. While most of the actual sounds are intact, the grunts and groans the characters make are notably lower in tone than the Sega CD port. Gameplay: Hmm, both interpretations really only used two buttons: one to attack and one to jump. As it offered more options, the CD game also permitted more styles of gameplay. You could choose from three button configurations, and the special attack — only possible on the SNES by pressing both buttons simultaneously — was now possible with only a single button press. In actual practice, both played identically. What wasn’t the same was the actual stages themselves; the SNES game is missing In fact, this is where it becomes a mess. For all its efforts, it lacks one of the textbook features of a beat-’em-up: two-player capability. Those playing Final Fight on the SNES had to do so alone, while their friends watched and finished off whatever snack chips were left. How Capcom could rush the game out without this feature is mind-boggling. Titles in the genre without it are severely crippled from the outset, and here was no exception. Compounding the playability issues on the SNES are a cornucopia of hardware limitation-related compromises that watered down the experience to a great extent. There was the elimination of the fourth stage and its boss (Rolento), as well as a notable lack of enemies onscreen. Whereas Final Fight CD featured up to four enemies onscreen at once, plus barrels and tires, the SNES rendition picks and chooses. Speaking of barrels and other item-providing objects, they were greatly reduced in number or were gone completely on the SNES, and great stretches of some stages were entirely empty. This, coupled with the reduced amount of enemies, made for some barren stages. It was as though Capcom opened Metro City for business and no one showed up to work. Final Fight CD had all the levels, including the both bonus stages (the second was removed on the SNES), and though it lacked all of the on-screen objects of the original, there was considerably more activity. Other: As I mentioned earlier, the new options menu on the Sega CD allowed you to change between difficulty settings and also offered settings for your life stock (up to seven) and extra life bonus based on score. Along with the time attack mode, it offered many more ways to customize your game than the cartridge could. All of these extra goodies made it the definitive one to own at the time, and even after over a decade, it still holds up. That perhaps, is what truly separates the two. Time has not been favorable to Final Fight on the SNES, a reality even more apparent when one takes into account the superior sequels on that appeared afterward on the console. Rushed to market in order to make it in time for the launch and severely underpowered, it failed to deliver the complete arcade experience. Even so, that doesn’t leave it without merit. To be fair, we must remember that it was released a full two years before the Sega CD came out, and it definitely didn’t have the development time it needed. Had Capcom pushed it back a few months, and had they at least added the two-player mode, it would have held up much better. So what should the discerning Final Fight fan do? Well, after emulation, the Sega CD is the closes you’ll get. Final Fight One on the GBA may be packed with more extras and be portable, but it lacks the incredible soundtrack and voice overs that make the CD game so special. Between the consoles, the SNES simply cannot compete with advantage the CD-ROM’s massive storage capacity offers. Enhanced audio, two-player capability, all three characters, all stages, and the added time attack mode put it over as the version to get. The SNES made a valiant effort, given the short amount of time the developers had to prepare and the newness of the hardware, but it ultimately falls short. Of course, given that Final Fight can now be played in a more authentic manner through the GBA release or on the wonderful Capcom Classics Collection on the PS2, PSP, and Xbox; perhaps neither of these two older attempts would be the way to go for someone looking for the authentic arcade experience. Regardless, I still recommend Final Fight CD for its exclusive extras and great soundtrack. It’s a leg up over the SNES rendition and was the undisputed king of them all for almost a decade. After all these years, it’s still as playable and great to look at as ever, which is what counts, right?